We’ll make your hair look delicious! Our hair stylists are not only talented, but also good listeners. Whether you’re refreshing your current hair style or trying something completely new, we’ll work with you to create a look you love! Permanent color, semi or demi permanent color all can enhance the beauty of your natural hair color or blend the grey away! 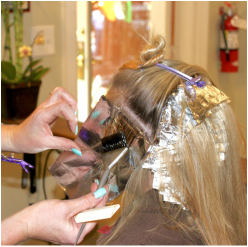 Let the stylists here at Salon Lisa Lisa design and implement the perfect dimensional color just for you. This amazing service lets you tame your mane, flatten your frizz and add shine to dull hair. The stylists at Salon Lisa Lisa can help you achieve smoother, silkier humidity-resistant hair that can last from 2 months to as long as 4-6 months! Transform your look or transition between hairstyles. Extensions are instant gratification - in one short appointment, you can have the fuller, longer hair you have always dreamed of! We use Hotheads brand extensions. Life altering hair extensions. No heat. No tools. No damage.